Published by Cyril Huze March 27th, 2016	in Chassis and Customs. Just four inches high, this minimalistic Road Glide® Low Profile Windscreen (P/N 57400310, $154.95) from Harley-Davidson®accentuates the shape of the Harley-Davidson Road Glide motorcycle fairing, hugs the contours of the Splitstream vent, and provides definition to the transition between the inner and outer fairing. Molded of hard-coated polycarbonate, the windscreen has an opaque black finish. 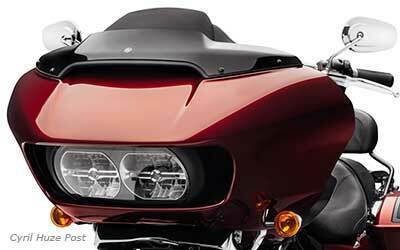 The Low Profile Windscreen fits 2015-later Road Glide models. Available at more than 750 authorized retail locations in the United States and online. Think i’ll stick with Klock Werks !! !